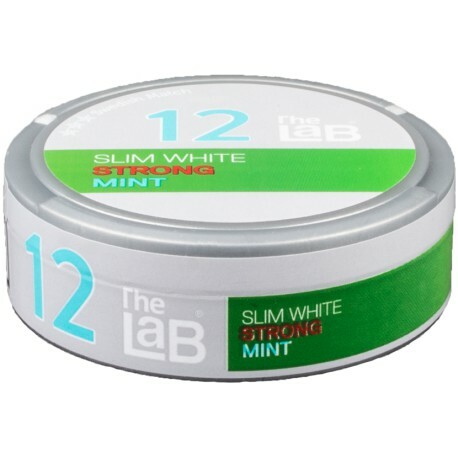 The LAB 12 Slim Fresh Mint Strong White Portion Snus continues the new Swedish-style mint snus flavor profile. You can taste tobacco with mint in the background but no mint burn. Number 12 uses the now familiar Lab Series Long Portion pouches and is a strong nicotine snus. The LAB brand of snus (short for laboratory, not Labrador Retriever) is very popular in Norway, the snus market it was originally designed for. The LAB is sold over-the-counter there and globally over the internet (where legal) EXCLUSIVELY by the SnusCentral.com Snus Shop! OK, we were kidding about the last part. We are not the only snus shop which carries The LAB Fresh snus series. Other snus shops carry it too. We certainly are the BEST snus shop to carry this and any other snus or my name isn't Moe Unz! This is going to be a very popular snus for mint snus lovers and the mint snus curious! From the mad snus scientists at Swedish Match. I like it because it has a good flavor that lasts. Takes about 20 minutes to develop. Good nic hit. General Mint is comparable. It has less nicotine, but it also has a lot more going on as far as taste. I would call it a draw. I'll buy whichever is on sale when I need my next delivery overseas. After giving a lot of other mint snus a try, I figured I would write about this gem. There's others out there that are pretty good in this category, but this one gets every detail right. Most importantly, it's nice and strong and the nicotine lasts longer than others. I've kept them in for three hours without that feeling like I need something more. The size and shape of the portion pouch is the most comfortable (for me). Best flavor I've found that lasts as long as the buzz. Doesn't dry out in the can before the can is finished. Like I said, there's others out there that get very close to being my favorite, but I always come back to the 12. If you enjoy the mint, this could be the one. If you like General White Mint this is a must try snus. Sweet, minty goodness with enough nicotine to get the job done. The pouches are perfectly shaped and filled and have an excellent soft feel. I'm on can 35 or so. A minty little slice of frosty satisfaction. Imagine a kiss from a beautiful Swedish Girl chewing Wrigley's Double Mint Gum and you can begin to understand what the guys at Lab have given to the world. Lab12 IS figureskating. Boom!!! That just happened. I like this Snus, I know shocking... I tend to like most of them. :) Anyway the flavor reminds me of General Mint White but with a creamier more refined finish. The portion is soft and the slim size fits comfortably and perfect for long work days. Now the best part - Nicotine!! The nic hit is strong yet smooth and beats out my old favorite General Mint White. The Lab 12 is an excellent Snus. I will be replacing General Mint with this and Skruf Slim Sun Fresh. If you like mint Snus I can't recommend this one enough. In my opinion, this is a pretty good snus. Flavor is just OK, but fades pretty quickly. No drip and decent nicotine hit. Overall, nothing special but a solid snus. I may not buy again, but will use again if some is around. The General product is far superior as far as longer lasting flavor, albeit with less nicotine. It was way better than I ever expected!!! I have Skruf Stark White Portion, Skruf organic Snus in the green can and this 12 Fresh Mint and this is always in my back pocket every day!!! By far my favorite SNUS ever!! I really wanted to like this one,but after going through about 6 portions,i realized it is just not for me. Appears to have a weird vanilla taste to it that just does not sit well for me in a mint snus.no doubt some folks will like it,seems there are many varying mint flavors out there,but for me,mint means peppermint or spearmint,not mint vanilla.one thing i will say is this stuff kicks like a mule,seems stronger than 14mg. But overall,after recently trying odens cold white dry ,ill be sticking to it and skruf slim for my mint cravings.